An exciton is a composite particle: an electron and a 'hole' (a positively charged 'quasiparticle' caused by the absence of an electron) bound together by their opposite electrical charges. In an indirect exciton, free electrons in one 2-D sheet can be electrostatically bound to holes that are free to travel in the neighbouring 2-D sheet. Because the electrons and holes are each confined to their own 2-D sheets, they cannot recombine, but they can electrically bind together if the two 2-D sheets are very close (a few nanometres). 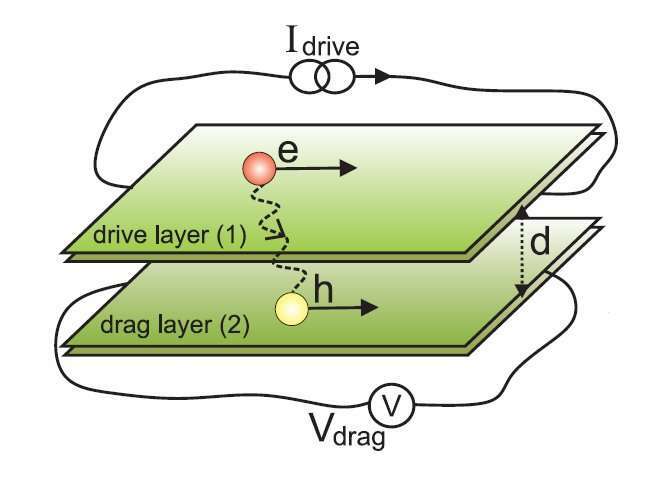 If electrons in the top ('drive') sheet are accelerated by an applied voltage, then each partnering hole in the lower ('drag') sheet can be 'dragged' by its electron. This 'drag' on the hole can be measured as an induced voltage across the drag sheet, and is referred to as Coulomb drag. To achieve this superfluid state, precisely engineered 2-D materials must be kept only a few nanometres apart, such that the bound electron and hole are much closer to each other than they are to their neighbours in the same sheet. In the device studied, a sheet of hexagonal-boron-nitride (hBN) separates two sheets of atomically-thin (2-D) bilayer graphene, with the insulating hBN preventing recombination of electrons and holes. Only recently, new, 2-D heterostructures with sufficiently thin insulating barriers have been developed that allow us to observe features brought by strong electron-hole interactions. The calculation of transport in both conduction and valence bands in each of the graphene bilayers was the 'missing link' that marries theory to experimental results. The strange negative drag happens when the thermal energy approaches the bandgap energy. The study, "Multiband Mechanism for the Sign Reversal of Coulomb Drag Observed in Double Bilayer Graphene Heterostructures," by M. Zarenia, A.R. Hamilton, F.M. Peeters and D. Neilson was published in Physical Review Letters in July 2018. Exciton superfluids are studied within FLEET's Research theme 2 for their potential to carry zero-dissipation electronic current, and thus allow the design of ultra-low energy exciton transistors. The use of twin atomically-thin (2-D) sheets to carry the excitons will allow for room-temperature superfluid flow, which is key if the new technology is to become a viable 'beyond CMOS' technology. 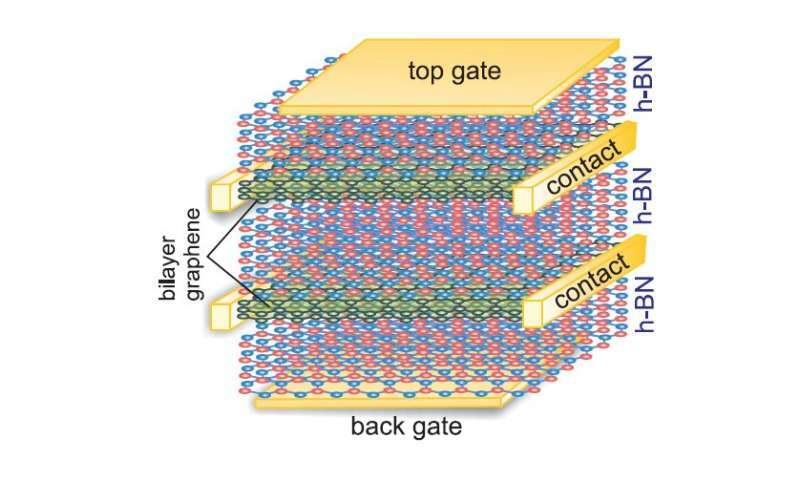 A bilayer-exciton transistor would be a dissipationless switch for information processing. A key challenge of such ultra-miniature devices is overheating – their ultra-small surfaces seriously limit the ways for the heat from electrical currents to escape.